Exciting spring things this week: red radishes (LOTS), spring garlic, and the lowest prices on salad greens we’ve seen in months! 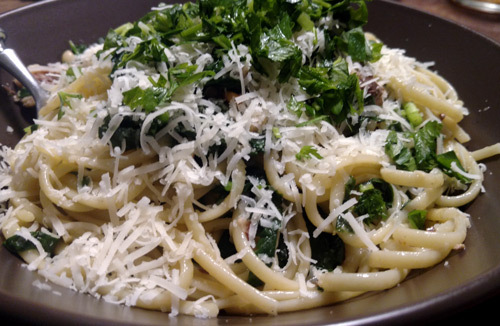 A plan for this post (and Tuesday night’s dinner) developed over the weekend, when this recipe for “Fastest Pasta with Spinach Sauce” appeared in my inbox, and I thought “YUM”. So, since spinach is in abundance right now, I thought I’d make it and then write about it — hopefully good things, but, you know, maybe not. Anyway, Tuesday kind of got away from us. We spent much of the day at Three Springs Fruit Farm, touring the orchards and learning about Wenk family history, the ways science has and is changing approaches to pest and disease management, and Three Springs’ plans for the future. I first met Ben Wenk (though I doubt he remembers) years before we had Radish & Rye, at a PASA Conference workshop about farm marketing via the web and social media, and have been a fan ever since. This was the first I’d been to the orchards, though, to see where the apples (and peaches and more) are actually coming from. One of the most interesting pieces to me was learning about how the topography of Adams County protects the trees — the mountains and hills create cold winters and cool springs, which delay budding on the trees (desirable because if they bud before the danger of frost has passed, the crop could be lost), and protect the valleys from both later frosts and severe storms, increasing the likelihood that buds, once set, will become fruit. I keep thinking about what a happy coincidence it is that the very topography that makes that land so ill-suited for other kinds of crop farming creates such good conditions for growing fruit. Very fast pasta with spinach as actually cooked by us. After touring the orchards (and picking up our apples for the week! ), Ben took us to Fidler & Co Craft Kitchen in Biglerville for a late pizza lunch — and samples of Three Springs’ newly launched Ploughman Cider. State law, of course, won’t allow us to sell the hard cider, but rumor has it that when the weather gets better, Ben and his crew may make some appearances at the Broad Street Market to peddle their wares themselves. Fingers crossed! All this to say, by the time we got home, it was 5pm, we had really just finished lunch an hour or so before, and I still had a few hours of work to do — and Dusty had a nap to take. Dinner got pushed back until after the Friends of Midtown Spring Social, which we arrived to embarrassingly late, but nonetheless got a tour of the very-cool St@rtup Harrisburg space, and chatted with neighbors and friends. And then stopped at HMAC on the way home for a quick beer. Because why not? And then finally, time for dinner — the fastest the recipe promised! And, really, it was very fast — we just didn’t follow the recipe. I mean, we plunged some chopped spinach into pasta water, so the fundamentals were there, but in the 15 minutes it took to make the dinner, somehow everything else changed — olives were replaced with parsley, pine nuts, parmesan, lemon juice, and a tin of oil-packed sardines. And, of course, we doubled the garlic. So the reality is, the plan didn’t work — I can’t tell you anything about the Mark Bittman/Jack Bishop recipe I intended to make. I can tell you, if you sub parsley, pine nuts, parmesan, lemon juice, and a tin of oil-packed sardines, it’s very good. Just don’t forget to double the garlic.